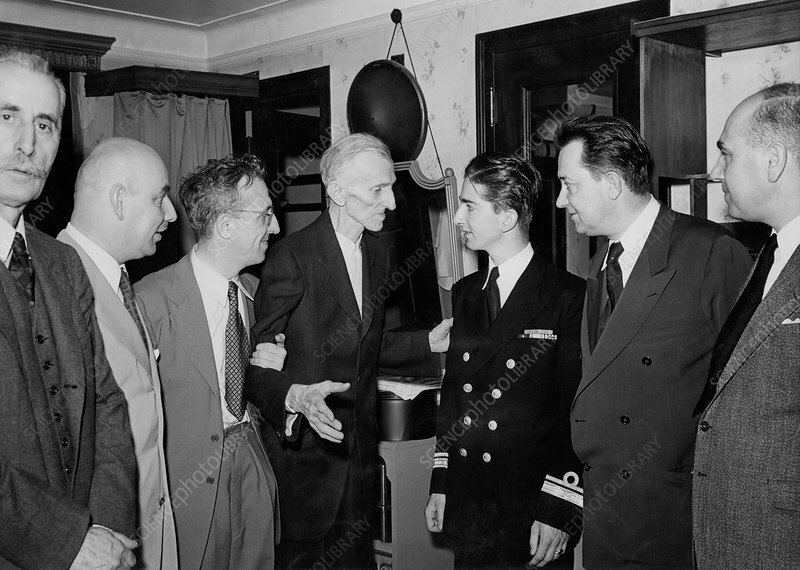 Nikola Tesla (1856-1943), Serb-US physicist and electrical engineer (centre), in his eighties, in New York, meeting with King Peter II of Yugoslavia (1923-1970, in uniform). Tesla was educated at Graz and Prague, but in 1884 he emigrated to the USA. Tesla carried out research that led to key advances in areas such as alternating current power generation and transmission. The SI unit of magnetic flux density is named in his honour. His early inventions were successful, but by the 1920s he was essentially bankrupt and running up unpaid hotel bills. From 1934, he lived in the Hotel New Yorker,with bills paid by his former employer Westinghouse Electric and Manufacturing Company. King Peter II was formally known as Petar II of the House of Karadjordjevic. Photographed in 1942.